(CN) – The active ingredient in popular weed killer Roundup may indirectly kill honey bees, according to a study published Monday that indicates the herbicide alters the balance of bacteria in the digestive tract of bees and makes them more prone to fatal infections. Because glyphosate targets an enzyme found only in plants and some microorganisms, Roundup is considered safe for animals, including bees. But a study published in the Proceedings of the National Academy of Sciences found the controversial chemical reduces the number of protective bacteria in the bee gut, many of which possess the enzyme glyphosate targets. With fewer good bacteria in the gut, pathogens immune to glyphosate or which grow faster than good bacteria can propagate and kill the bee, according to Erick Motta, a graduate student at the University of Texas at Austin who led the research alongside evolutionary biologist Nancy Moran. Bees with microbiomes weakened by glyphosate died in far greater numbers when later exposed to a common bee pathogen compared with bees with a healthy microbiome. “It’s a very complex story we’re still trying to understand,” Motta said in an interview. Motta and Moran exposed two groups of about 650 honey bees each to different concentrations of glyphosate commonly found in crop fields, yards and roadsides and marked them with colored paint for easy identification, then returned them to their hives at the UT-Austin campus. After three days, they found a statistically significant reduction in four of eight dominant species of beneficial gut bacteria in exposed bees. All four affected species had been reduced by more than half compared with control bees, according to Motta. In a second experiment, the bees were exposed to Serratia marcescens, a widespread opportunistic pathogen affecting bees worldwide. About half of the bees with a healthy digestive tract were still alive eight days after exposure to the pathogen, but only about a tenth of the bees with microbiomes impaired by glyphosate were still alive. Motta said the results may implicate glyphosate in colony collapse disorder, a phenomenon in which millions of bees began vanishing from their hives about 12 years ago, leaving farms with fewer bees to pollinate crops. Exposure to pesticides and antibiotics, habitat loss and bacterial infections are also considered culprits. Dave Goulson, a biology professor at the University of Sussex in the United Kingdom, also said the new results implicate glyphosate in the phenomenon. 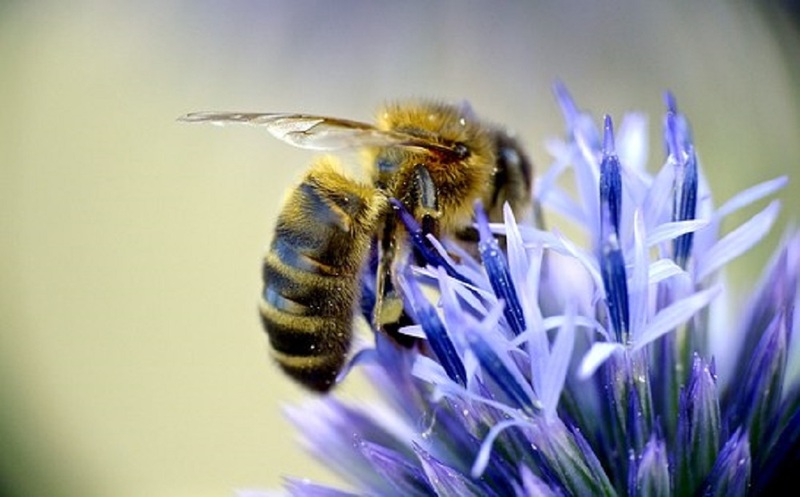 “Those of us that study bees have long ago come to the conclusion that colony health is adversely affected by a number of interacting stressors, including exposure to cocktails of insecticides, fungicides, impacts of pathogens, and effects of poor nutrition,” Goulson, who studies the ecology of bees, wrote in an email. Due to its apparently low toxicity, glyphosate has become the most widely used agrochemical in history. Monsanto, now owned by German pharmaceutical company Bayer, introduced Roundup in 1974, and its use exploded in 1996 after the company began selling “Roundup-ready” seeds engineered to resist the herbicide. More than 2.6 billion pounds of the chemical were spread on U.S. farmlands and yards between 1992 and 2012, according to the U.S. Geological Survey. Motta said guidelines for glyphosate use may need to be changed. He and Moran recommend that farmers and gardeners avoid spraying glyphosate-based herbicides on flowering plants when bees are foraging. But Motta cautioned that additional research is needed first. His team, which includes former UT-Austin postdoctoral researcher Kasie Raymann, initially intended to track the bees long enough to see if their microbiota would recover from glyphosate exposure. But most of the marked bees had left the hive after three days, possibly due to sickness or stress. Motta said he intends to track glyphosate-exposed bees longer term in a follow-up study. “Maybe when we get [more] results, if we see something similar, we can start considering what are the ways to avoid this exposure,” he said. John Boelts, owner and operator of Desert Premium Farms in Yuma County, Arizona, agreed. “If changes are needed in farming practices to safeguard pollinators, farmers will be the first to want to do that,” Boelts said by phone. Bees, he said, “are absolutely essential. The things we eat, the things we put on the dinner table absolutely rely on” them. But Boelts, who grows lettuce, cantaloupe, cotton, durum wheat and other crops on 4,000 acres of land, said unless additional research corroborates Motta’s and Moran’s results, he won’t change how he uses glyphosate-based herbicides — and doesn’t think most other farmers will, either. Glyphosate inflicts less environmental damage than other weed killers and older farming practices like tilling, he said, and previous research has found no adverse effects on adult bees in colonies treated with realistically high levels of glyphosate. On the phone, Motta acknowledged he could get pushback from people who use glyphosate, especially in light of a recent $289 million jury verdict finding Roundup caused a school groundskeeper’s terminal lymphoma. Arguing that it’s scientifically impossible to determine the cause of a single person’s cancer, some see the verdict as the opening shot in a campaign to phase out the herbicide. The fact that colony collapse disorder hasn’t been reported in Australia despite Roundup’s use there, and that Roundup had been sold for roughly three decades before the phenomenon appeared, may also leave users of the herbicide questioning advice to curtail its use.